The Galaxie 45TH ... large-sized sliding door. 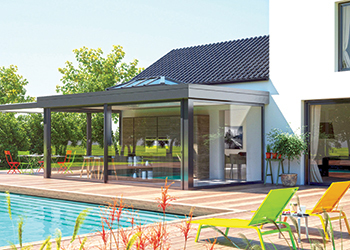 Installux Aluminium has expanded its sliding doors and windows series with Galaxie 45TH, its latest innovation aimed at meeting market demand for very large-sized sliding doors. Galaxie 45TH has simple, slim, clean modern lines with the highest energy-saving ratings and performance levels in its class, says Basim AlSaie, managing director of Installux Gulf, the regional office of the French aluminium systems provider. The lift-and-slide sliding door was developed to accept high-performance glazing (double and triple), up to a maximum thickness of 45 mm and 450 kg of weight per sliding panel, he adds. Another feature of the product is the slim bottom rail, which is only 20 mm in height that allows the bottom rail track to be embedded in the floor while facilitating easy access for wheel-chair users. This product also allows for corner sliding panels to open at 90 degrees, further enabling designers to open the inside space to the outdoors and create unobstructed views. In terms of security, the system is supplied with a high-security multi-point locking mechanism that ensures the highest level of protection for very large and tall sliding doors, says AlSaie. Ansam on Yas Island, Abu Dhabi ... Installux project. “Once anyone has seen and experienced the Galaxie 45TH, it would be very difficult to look at and consider anything else. The feedback we received from The Big 5 exhibition in Dubai last November – where this new series was introduced – was that it is the most elegant lift-and-slide system on the market,” AlSaie remarks. In line with its goal of introducing innovations that offer the highest energy efficiency and performance rating, Installux Gulf has been releasing a new product every year for the past three years. “Installux Gulf is proud that it can offer its clients, architects and consultants, and the market at large the latest generation of energy-efficient aluminium systems,” says AlSaie. Among the recent projects executed by the company is Phase One of Ansam, a resort-style residential development by Aldar Properties on Yas Island in Abu Dhabi, UAE. Installux Aluminium is a leading French architectural aluminium systems manufacturer and part of an independent French group with a history dating back to 1923. Its subsidiary for the Middle East market, Installux Gulf, was established in 1997. 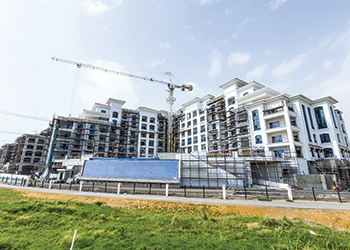 The Bahrain-based firm supplies a wide range of products for the residential and commercial building segments, meeting the highest international standards for performance, energy saving, and durability.